We made it to Tennessee and have already had quite the adventure! We are all a little road weary after having been in the car for about three days. We stopped in Little Rock for Friday night and made it here late Saturday evening. Our day started early Sunday morning. Chet and his dad spoke in Tullahoma, TN and in Cookeville, TN that day. Each about ninety minutes from Nashville and sixty minutes from each other. It was a great day, though! A lot of lives were touched, we visited with several different family members, and met a lot of interesting people. Even the van has had enough of driving everywhere! The shock absorber broke last night, making an awful noise as we drug it down the pavement. We are thankful that it waited until we were pulling into Chet's aunt and uncle's driveway and not on the highway. After searching all day for the part, the local repair shop has one that will be here later this week so we can continue our trip onto Kansas City early next week. Although, Chet and I were a little bummed about not being able to get out and explore the city, Hannah was ever so grateful not to have to be in her carseat again! My favorite pic of the day! We head out tomorrow for Tennesse! We will be gone for a couple of weeks this time. Chet and his dad are speaking at Lipscomb's Summer Celebration and at several different churches. After we finish up there, we'll head to Kansas City where Chet will speak at a children's hospital to a group of kids who have diagnosed with various things that will affect them for the rest of their lives. We are excited about all of the opportunities and getting to spend time with Chet's family, as well as a few good friends. We'll try to blog some while we are gone. Be sure to check Chet's blog for even more information! Hannah has recently decided she likes spending time in her room alone sometimes (she gets that from me). 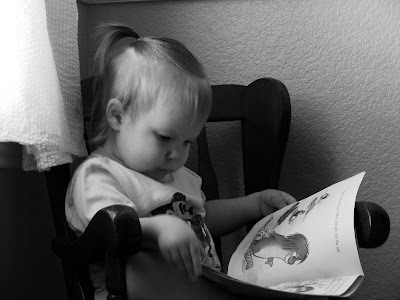 I often find her quietly reading her books in her rocking chair. We did some rearranging yesterday and moved her tent in her room along with a few toys. About every other day, Hannah decides she doesn't like her vegetables (she gets that from her dad!). Other days, she can't get enough (yes, they are the same ones she wouldn't touch the day before). Yesterday, she decided that Radar needed to eat her vegetables. Normally, she is in her booster seat and Radar is banned from the kitchen during dinner, but our table is covered with stuff for our trip so we had a picnic last night. Future Vet? She likes to examine Radar's feet. Happy Father's Day! I love watching our sweet girl spend time with her daddy. I don't think there can be anything sweeter! Happy Father's Day to both of our dads, grandfathers and to my husband. Thank you so much for all you do and for the wonderful fathers that you are! We had Summer Spectacular (VBS) this week. As usual, it was a blast! This year, we studied the story of Esther. Hannah loved going to Bible class and watching the big show. She'd dance along during the songs and applaud after each one! Her favorite part was probably when the horse came through the auditorium carrying Mordecai. She kept looking for him all through the rest of the show that night! This weekend, we traded Hannah for my sister, Jamie, and headed down to San Antonio for a wonderfully Wicked weekend! 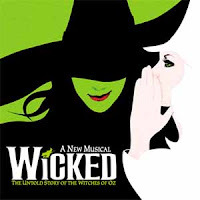 The musical, Wicked, was on tour down there at the beautiful Majestic Theatre. The theater is one of my favorite places to go. Built in the 1920's, the architect designed the inside to look like a very elaborately detailed Mexican town complete with clouds floating past the stars twinkling on the ceiling. The show was wonderful, of course! We had seen the show when it came through Dallas a few years ago and knew then if it were ever within driving distance, we would find a way to go see it again. As I am writing this, Chet is trying to find another time we can see it later this summer that will coincide with a trip to speak out of town! Here's a few pictures from our trip. If you know my sister, you know that if a camera comes out, her hand flies in front of her face. I did manage to get one good picture of her and several of the beautiful sites around downtown. able to come home to this sweet little girl! We've had an exciting day! We had a great morning at our friends, Christa, Mason, and Brayden's house playing outside and in the water. Hannah had a blast keeping up with the five boys (Christa's two boys plus three nephews) and didn't seem to mind a bit that she was the only girl. Of course, Christa and I both forgot to take any pictures of the day. After saying goodbye and blowing kisses to Brayden, Hannah came home to take a three hour nap! (This was exciting for Mom!) Shortly after dinner, the four of us sat in the bathroom waiting for the storm to pass reading Chicka Chicka Boom Boom (Hannah's favorite story). A tornado was spotted just to the north of us! The storm passed quickly, and the day ended with a beautiful sunset and a rainbow. What a fun, crazy, wonderful day it has been, but I do think it is time for bed! Just some sweet pics of our girl in her pj's and pigtails. Hannah and I took advantage of the gorgeous weather and got out her new splash pool. She had a blast, once she became used to it spraying her! The pool we got this year is more of a tarp that has sprinklers all around the edge. I love her sweet expression in this picture! I just wish I knew what she was thinking here! Here, she is trying to get Radar off the porch and to come see her. As you can imagine, he didn't go for it!